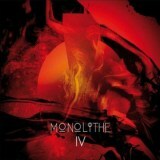 France's Monolithe are a hard band to approach by the casual doom fan. The band's albums are given numbers, not names, and each consists of one very long, 50+ minute piece – you don't dabble in this band's work, you sink yourself into it. I've been a fan since hearing Monolith II, although have been making promises about Monolithe III to a certain member of the forum for a long time now, I've never actually got around to writing any of the band's albums up. Hopefully this will make up for it, and not least because this is an excellent album, another weighty addition to what is becoming a fascinating mythology about the creation of humanity (not that I understand any of it, but much like the music, this is enhanced by mysteriousness). 'Weighty' is the perfect word for an album that so embraces the heaviness of funeral doom, yet puts it to work in such a powerfully atmospheric way – never content with the turgid earthy nihilism of the genre, Monolithe have always tried to rise into prog metal realms with structure and addition of other elements, and here they've judged it perfectly. The piece begins with slow yet clearly prog-tinged doom riffing, building with horror-film keyboards and lashings of atmosphere, gripping immediately. The majority of the track is slow, crushing doom done to perfection, a compelling and majestic sound that summons such worship from devotees for a reason. Obviously being a single long track it's impossible to describe in detail, but my personal highlight is an orchestral flourish that leads to a wonderful passage where the melody lurking behind the heaviness becomes the focus, to absolutely glorious effect. Yet of course this isn't an album that's about moments, because the whole is just too good, especially when you've been listening long enough to get drawn in and allow yourself to be overwhelmed by it. You will find yourself grasping at a particular riff, a change in tempo, a droning wail, and enjoying them as the epic metal moments that they are, but you're quickly carried along, the band your guiding hand in this interstellar tour guide. That wonderful artwork, various fiery reds, sums this album up well – shifting currents of aural lava telling the story of the birth of worlds. Yet clichés aside, there's a reason that people use such imagery to talk about albums like this, and it's because they deserve them. Monolithe IV is a wonderful doom album, an easy contender for the year-end awards, and a stunning reminder of the power of metal. Awe-inspiring.